Let me show you how to make three delicious salad dressings that will spruce up a salad and put the wow-factor into any vegetable. I am going to start with a classic dressing - mustard, olive oil and vinegar dressing. This dressing will add punch and an amazing taste to your vegetables. And to top it all off, it is healthy as well. • Mustard contains curcumin – a powerful antioxidant which is also found in turmeric. • Extra virgin olive oil also contains antioxidants, as well as anti-cancer compounds. • Black pepper contains piperine, a phytochemical that helps you to absorb more of the nutrients in the food you eat. Make the dressing by placing the mustard, salt and pepper and the vinegar in a bowl. Whisk the ingredients together and keep on whisking while very slowly adding the olive oil (if you add the oil too quickly the dressing will split) – until all the oil has been incorporated. Add the water and whisk again. 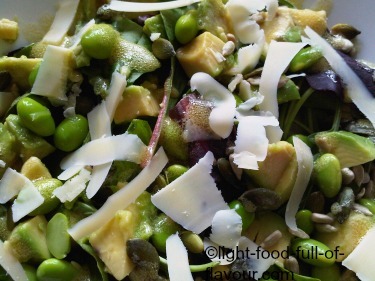 For an extra tasty and healthy kick, add 1 crushed/minced garlic clove to this dressing. 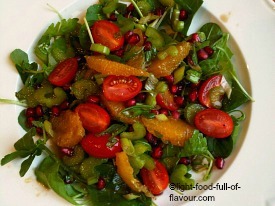 This is an amazingly tasty dressing that will liven up many a salad. 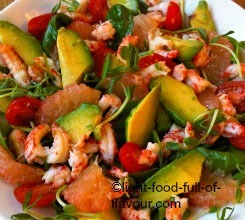 Take a look at my Orange and Tomato Salad and Prawn and Grapefruit Salad where I also add the segments of oranges/grapefruits to the salads. Place the orange juice, balsamic vinegar, olive oil, honey and pepper in a bowl and whisk until well combined. For the third version of my three delicious salad dressings I want to show you an easy way to make an Asian-style salad dressing. Simply mix all the ingredients together and add to your salad. 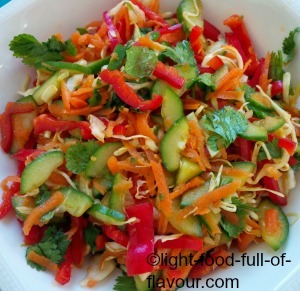 For more tips on Asian-style salads and dressings, see Crunchy Thai Salad, Asian Coleslaw and Asian-style Carrot Salad. PS. The fastest way to add oomph to your salad is to simply drizzle some olive oil and balsamic vinegar over your vegetables. Toss and Bob’s your uncle!